BLACK WIND is a collaborative multimedia production. It involves live music, recorded sound, visual projections and a theatre performance. Taking the image of ‘black mist’ the words the Aborigines used to describe the fallout from the atomic tests the British conducted in the 1950s and 60s at Maralinga in the desert of South-Australia – BLACK WIND expands upon the consequences of the Maralinga tests as a metaphor for human catastrophe and irreparable environmental devastation, and the profound psychological damage one associates with the darker forces of human existence. The tests at Maralinga may have contributed to the nuclear age but the ancient, vast and now eroded landscape within the heart of the Australian continent where the Aboriginal people have lived harmoniously for over 70,000 years, has been dramatically ruptured by the relatively recent, colonising Anglo culture. Maralinga, as an encapsulation of the insidiousness of imperialist invasion, is a poignant reminder, a starting point for the images and sounds that make up this project. The duration of the performance is 25 minutes. Collaboration implies a coming together for a specific purpose: BLACK WIND is the synthesis of the artists’ ideas and responses, and how these could be brought together in one performance yet, at the same time, highlight each individual art form. 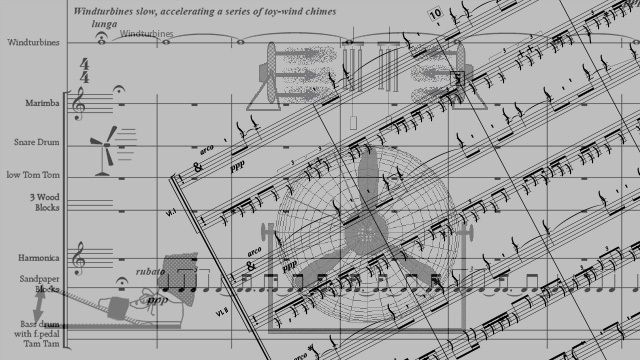 The project is the culmination of extensive dialogue and experimentation resulting in a rich, multi-layered work – sometimes harmonious, at times visually and acoustically provocative, the confluences, contrasts and counterpoints revealing the complexity of the creative process and the different experiences of the individual collaborators. Composer Kim Bowman was trained in the visual arts and studied composition at Rotterdam Conservatorium. His works possess a pulsing, hectic quality that while echoing eight centuries of the classical tradition, are energised by stripped back chords, new and strident instrumentation and fast sequencing. Images by Susan Norrie will be projected, cinematically-scaled, on a large screen above the orchestra. The film will draw on the research that has informed her recent internationally-acclaimed video installations: Undertow (2002 (Melbourne, Sydney, Berlin, Auckland); Passenger 2003 (Sydney, Tokyo, Melbourne) and Enola 2004 (a commissioned work for the Biennale of Sydney and included as a satellite project for the 2004 Film Festival of Rio de Janeiro). Soloist Claire Edwardes is a very distinctive and talented young percussionist renown for her very lively and energetic performances. BLACK WIND incorporates some of her hand-made percussion instruments that not only have a vibrant, sonorous quality but a visual and kinetic presence as well. She has extensive performance experience as a soloist with orchestras throughout Australia, the Netherlands, the UK and the USA. 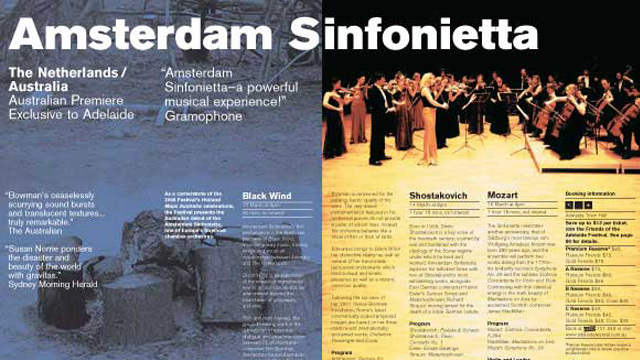 The Amsterdam Sinfonietta, founded in 1988, is Netherlands foremost chamber orchestra – especially when it comes to contemporary music and the conductor, Belgium born Etienne Siebens,has gained an international reputation for his outstanding performances of, and commitment to, the most challenging exponents of contemporary music. 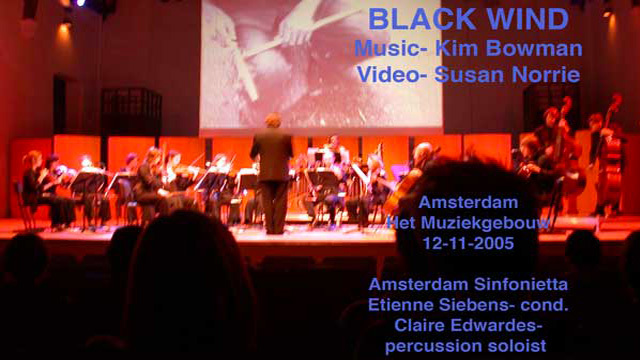 BLACK WIND forms part of an Amsterdam Sinfonietta program that includes works by Australian composer Brett Dean as well as by Dutch composer Louis Andriessen. There were three performances in Europe – two in the Netherlands (Amsterdam and s-Hertogenbosch, as part of the November Music Festival 2005), the third in Belgium. 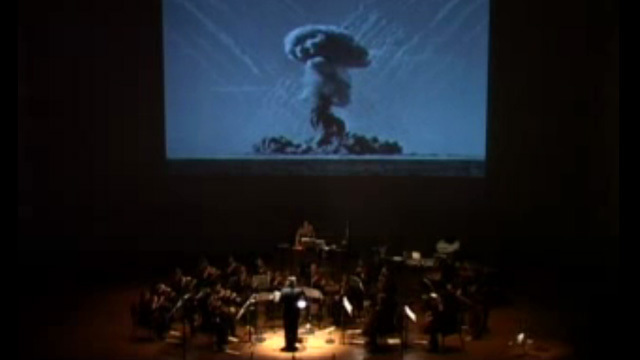 Another performance took place in Australia, as part of ther Adelaide Festival in 2006.